Oil prices have surged. These three stocks are set to profit (even if oil prices fall again). After approaching $80 per barrel for the first time since 2014, oil prices have taken a bit of a breather over the past week. But since bottoming out near $26 in early 2016, savvy investors have done very well by shopping in the oil patch. So has the best money in this cycle already been made or is there still opportunity? According to three Motley Fool contributors, there are still ample opportunities to profit in the oil and gas segment as some left-behind subsectors start to catch up to the higher price trend. Three in particular that are well-positioned going forward are Transocean LTD (NYSE:RIG), National-Oilwell Varco, Inc. (NYSE:NOV), and Devon Energy Corp (NYSE:DVN). Three timely stock buys in the oil patch. Image source: Getty Images. Keep reading below to learn what sets these three oil stocks apart from others and what makes them "buy now" picks for your portfolio. To put it in plain English, you can buy Transocean for less than 50% of the carrying value of all its drillships, cash, real estate, and other hard assets, and that's even after having taken billions in impairments against the value of many of its oldest, least-economically viable drilling vessels in recent years as it removed those ships from its fleet. Today, Transocean operates a modern, high-specification fleet, putting it in an enviable position. Exploration and production spending has finally started growing again, but the industry has a substantial amount of consumed oil it hasn't replaced with new discoveries in recent years. Offshore oil is going to be a major source of resource replenishment over the next decade, whether oil prices continue to climb past $80 or not, and Transocean is set to be a major player in finding and producing that oil. 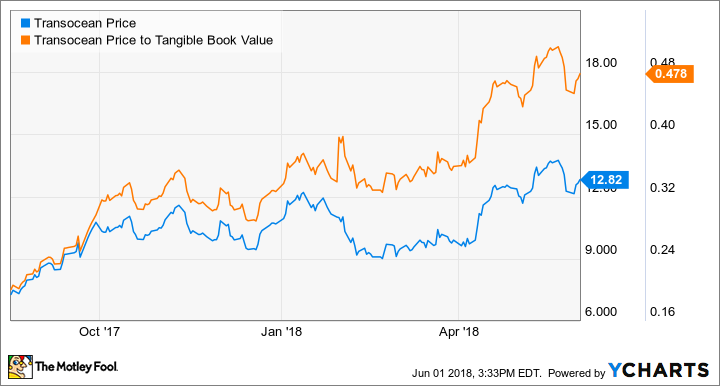 There are no promises the stock price won't fall again in the near future, but if you're comfortable riding out more choppy waters ahead, Transocean at half its book value is a solid "buy now" opportunity in the oil patch. Tyler Crowe (National Oilwell Varco): Man, what a difference six months makes. At the beginning of the year, the narrative about the oil and gas industry was how much money companies could make with oil at $60 a barrel and how producers weren't going to be super excited about expanding capital budgets. Today, the price of Brent Crude oil -- the international benchmark price -- is $77 a barrel. Some people will point to short-term catalysts such as the Iran nuclear deal, but one thing that is vastly overlooked is the lack of investment in new production to replace existing sources. 2017 capital expenditures for exploration and production companies globally were 40% less than what they were in 2014. As existing sources decline, producers are going to have to start spending much more on expanding production. That increased demand for capital spending plays right into National Oilwell Varco's hands. The company is the largest supplier of oil and gas equipment, ranging from disposable drill bits to all the drilling equipment on an offshore rig and the critical components of FPSO's. One of NOV's highest-margin businesses is selling aftermarket and replacement parts, which are going to be in high demand as producers and other service providers reactivate idle equipment. We have already seen this happen with onshore rigs in the U.S., and we're probably not that far away from seeing similar reactivations internationally and offshore. Look, the oil market is cyclical, and underinvestment after a period of low prices is nothing new. It's just that there is always some new wrinkle that makes Wall Street say "it's different this time". Chances are this period of underinvestment will lead to higher oil prices -- even from here -- and then a massive wave of capital spending. If you want an investment that will do well in this environment, National Oilwell Varco is the place to look. John Bromels (Devon Energy): Value is getting tough to find among independent oil and gas exploration and production companies (E&Ps) these days. That's because the soaring price of oil has the market anticipating big paydays for drillers of black gold. But thanks to a dismal Q4 2017 earnings report back in February, Devon Energy's share price was down as much as 25% at one point, and it is about where it was at the start of the year. That's a far cry from most of its peers, which are sitting on double-digit returns. For Devon, delayed wells and unscheduled maintenance caused the company's production numbers to suffer, which had investors fleeing the stock. Fast forward to May, and Devon's Q1 2018 results were light-years ahead of the prior quarter. Oil production was at the top range of guidance, thanks in large part to two Permian Basin wells that spit out a combined 24,000 barrel of oil equivalents in the first 24 hours. That's the highest initial rate ever recorded in the Permian. These and other high-performing Permian wells caused the company to boost production and cash flow forecasts. All that good news did boost Devon's share price from the low but given the company's excellent prospects in the red-hot Permian for 2018 and beyond, it looks like a strong choice to snap up now.